I have been remiss in reviewing the third new pasta at Panera Bread, forgive me, there was an unpleasant bout with food poisoning in there (NOT caused by Panera) and my knitting group moved back to Knit Knack, our wonderful home knitting store, and so I hadn’t been to Panera in a while. I have been getting quite a few search hits on my review of the first two pastas, so I felt duty-bound to the foodies of the internet to review the third. I knew people would be looking for information on the pastas as soon as word spread, and I was certainly frustrated in my quest to find any, so I hope this is helpful. 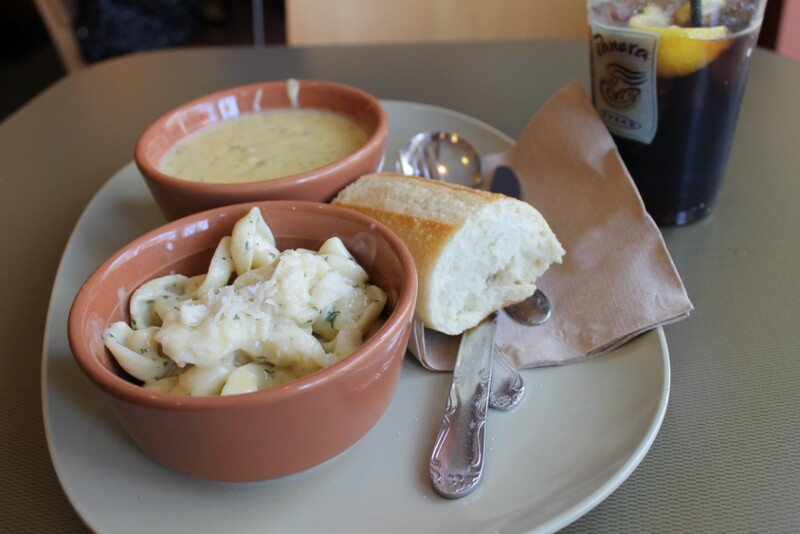 I tried the third pasta, Tortellini Alfredo, in combination with the broccoli cheddar soup. This was quite a cheese-laden lunch. Upon reflection, I should have chosen the tomato soup as a contrast. Still good, however. This is what you get for 10.70, including tax, at the Panera Bread in Fort Collins. Pasta/soup combo with baguette (small size) $8.29, regular soda $1.59. 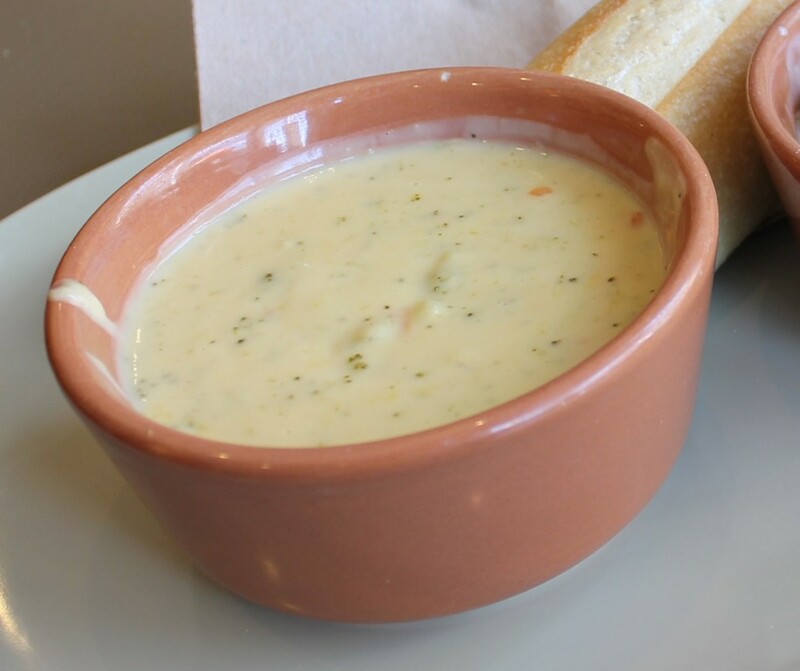 This soup is certainly cheesy. Other than the broccoli, it also has shredded carrots. Most of the broccoli is in small chunks, and it has been cooked rather well, but there is still a little bit of resistance there, not cooked to mush. Great winter or cool weather comfort food, best for dipping the baguette. As I expected, the tortellini is my least favorite of the three pastas, because it is the least interesting. It did surprise me with its strong cheese taste, however, because I thought the 6-cheese filling in the sacchettini was kind of bland, and this had more of a bite to it. The six cheeses listed in the sacchetti are: ricotta, parmesan, romano, monterey jack, cheddar, and mozzarella. The three in the tortellini are: ricotta, swiss and romano. I am guessing it is the swiss that jumps out. I was pleasantly surprised on the first bite. Again, this is not a fresh-made, hand-crafted, al dente pasta. You need to go to your hometown Italian restaurant for that. But it is a fine alternate to a sandwich or a salad at Panera if you are not in the mood for one of those. My favorite is still the cavatelli, second favorite is the sacchettini, and third is the tortellini. 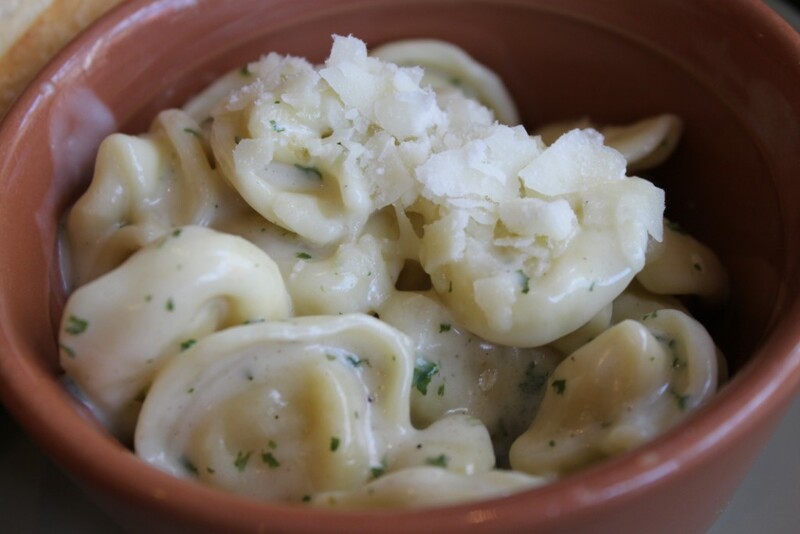 If you are a tortellini or Alfredo lover (or a pesto hater! ), your mileage may vary. This entry was posted in Panera Bread Pasta, Restaurant reviews and tagged panera bread pasta, restaurant reviews, soup by glenderella. Bookmark the permalink. We have a Panera in Mankato (hour away). Candy & I got sometimes. When you hit a town only once a month, you have to spread your choices out. I read your review and went to Panera for the pasta. The penne with bolognese sauce is great. I like it so much I’m going to try to make it myself this weekend. Thanks for the reviews and all the great recipes! If you find a good recipe for bolognese, let me know, every restaurant seems to have a different one! I like to add their roasted tomatoes to this pasta. It gives it exactly what it needs to not be so bland. I love it that way! Bland, boring, not worth the calories & fate.